Transformed and empowered leaders are critical to leading congregations to do God’s mission in the world in this challenging era in congregational life. Regardless of your membership numbers and weekly worship attendance, the size of your budget and endowment, or even the strength of your faith formation and community outreach programs, every church in America is facing a rapidly evolving religious climate and culture. Whether experiencing sustainability challenges or wanting to maintain an exciting pattern of growth, congregations are looking to transform their ministry and connect with their community in new ways. Hope Partnership’s ecumenical services can help. New Beginnings is for the congregation that knows it can’t continue ‘as is’ but doesn’t yet know what to do—and needs to make a choice. 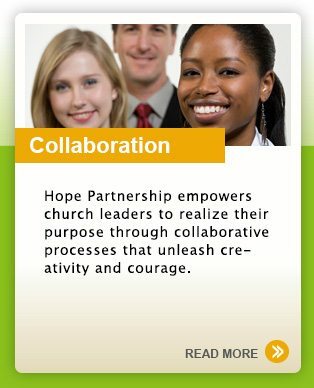 Mission Pathways is for the congregation that is ready to move forward using a self-led process. Epiphany is for the congregation longing to become a transforming presence both inside and outside of its church walls. Recasting is for the cluster of congregations seeking to unleash Spirit-filled energy from working in community.